Day 4 is in the books in the 2014 PokerStars Caribbean Adventure main event. Only 20 players remain from the 1,031 that entered this event, with each of them guaranteed at least a $70,700 payday, although they surely have their hopes set on taking down the title and the first-place prize of $1,820,420. The chip leader heading into day 5 is 27-year-old Estonian poker pro Madis Muur, who will sit down with 3,515,000 on Sunday. Muur play primarily online, only participating in his first few live main event’s on the EPT after qualifying online. He finished 12th in the European Poker Tour Barcelona last fall for $77,981. Close on Muur’s heels is Mike “Timex” McDonald with 3,432,000. 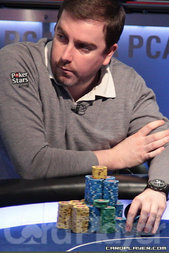 The Canadian poker pro is a prior EPT main event champion, having won in Dortmund in 2008 for just under $1.4 million. McDonald is drawing live at becoming the first-ever player to win two EPT main events, a feat which no one has achieved in the tour’s nine and a half seasons. Other notables with large stacks heading into day 5 include 2007 Card Player Online Player of the Year Isaac Baron (1,556,000), recent EPT Prague finalist Max Silver (2,355,000), World Series of Poker bracelet winner Pascal Lefrancois (2,432,000) and 2009 WSOP main event finalist Antoine Saout (2,432,000).